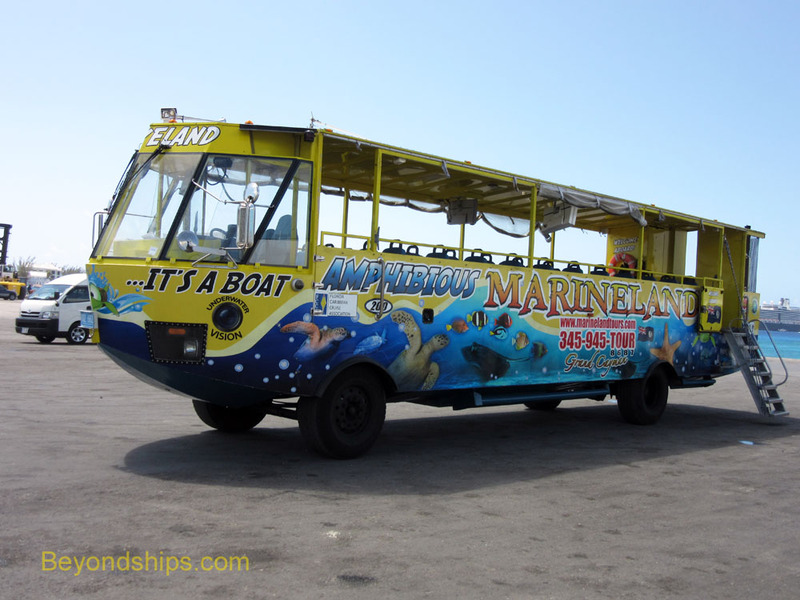 Amphibious tours have become popular worldwide. You see them in London, Halifax, Boston, New York and many other cities. They combine the sightseeing experience of a tour bus with the fun of a boat ride. In Grand Cayman, the Amphibious Land & Sea Adventure also offers the intriguing prospect of viewing sights not just on land and from the sea but also sights that are beneath the waves. The tour operators proclaim that the Hydra-Terra Amphibious Bus is both a bus and a boat. However, do not expect a seagoing luxury tour coach or even an aquatic version of a Greyhound bus. Rather, the bus is a military-type vechile similar to the Ducks used by the U.S. Army and Marine Corps during World War II. The passengers sit in a boat-like structure high above the pavement on four large wheels. Its sides are open but the top is covered by a metal canopy. At the back of the vehicle are two propellers that drive the bus through the water when it goes to sea. Although inspired by military vechicles, this particular bus was built for civilian use in South Carolina. The guide said that it uses a Ford truck chasis. In any event, one unique thing about this bus is the cameras mounted on the underside. These are linked to several large flat screen panels in the passenger compartment. As a result, the passengers can see what is happening beneath the waves when the bus is in the water. The tour began with a short trip through downtown George Town. As we passed by several government buildings, the guide explained the system of government in the Cayman Islands and took a few good natured jibes at the island's politicians. We drove past Heroes Square with its statue of James M. Bodden, who, the guide explained, championed the idea that of making tourism one of the islands' major industries. We also saw the post office, the Cayman National Museum and the Elmslie Memorial Church. The latter was designed by a shipbuilder, Captain Rayal Bodden, and so its interior looks like the inside of a ship turned upside down. After proceeding along the shore road, the bus turned down a sloping drive that lead into the bay. With a slight splash, the bus plunged into the water and the propellers took over. Whereas we had been sitting quite high over the street, once we were in the water, the sea was only a foot or so below the passenger compartment. Consequently, you could look down over the sides and see through the crystal clear water to the coral outcroppings amidst the otherwise sandy bottom. A much sharper view of the bottom, however, appeared on the flat screen televisions. This was especially good as we passed over the shipwrecks that lie in the bay off George Town. We passed over two shipwrecks. Both of these had been sunk by hurricances that struck the Caymans unexpectedly in the early 20th century. The first of these had been carrying a cargo of rice. When the cargo got wet, it expanded and caused the ship to burst apart. The second had been carrying a cargo of lumber. This was salvaged by the same person who designed the Elmslie Church. Looking over the side of the bus, the wrecks were vague outlines that were not really recognizable as ships. However, looking at the screens, you could easily make out man-made objects and the architecture of a ship. The Hydra Terra Bus continued onward out into the bay where five cruise ships lay at anchor. 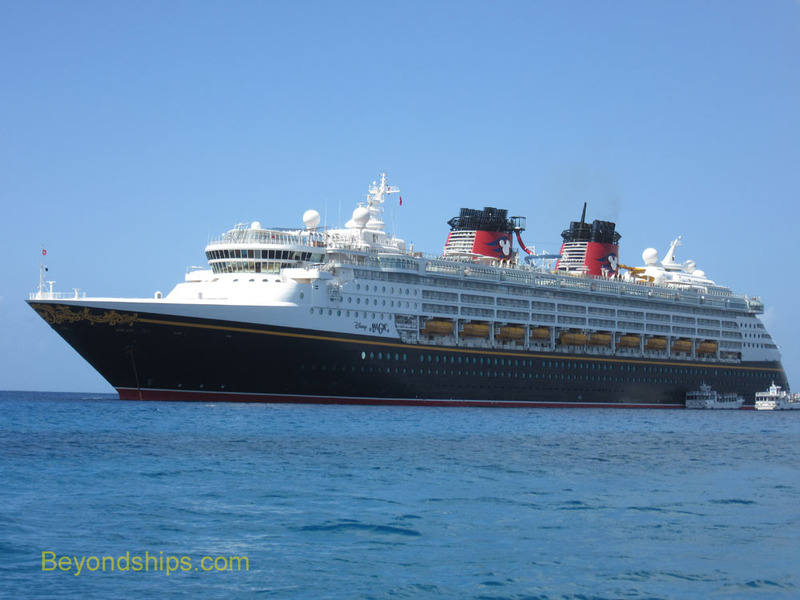 While circling one of them, the guide explained that ships cannot anchor anywhere they please in the bay. Rather, there are specific anchorages in designated locations. This is done so as to protect the coral that lives on the reefs that dot the bay. 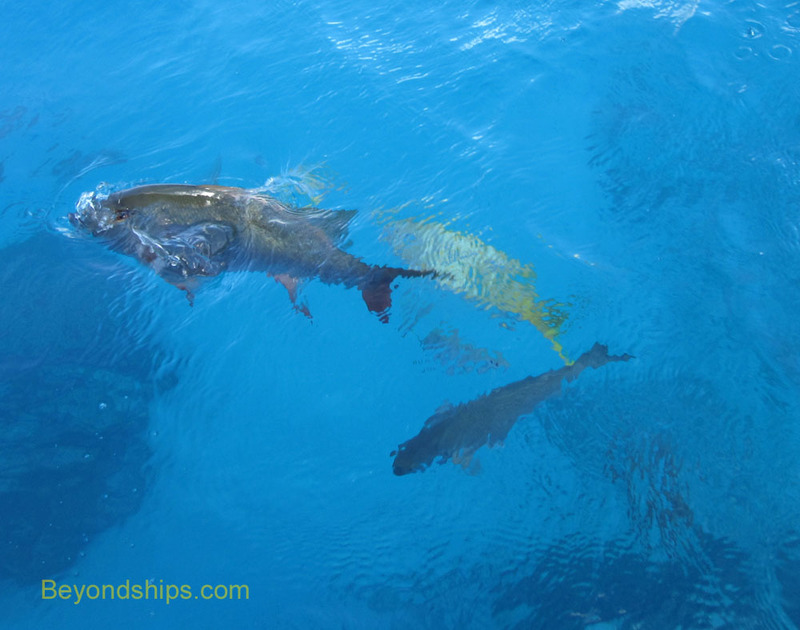 Passing over one of these reefs, the guide tossed some bread overboard. This immediately attracted a swarm of fish including yellow fin snapper and seargent major fish. Each guest was given a slice of bread to distribute among the diners. Once again on the shore road leading away from George Town, the bus soon came upon a line of resort hotels, condominiums, and shopping plazas. Although not visible from the bus, on the other side of these buildings was our next destination - - Seven Mile Beach. Although Seven Mile Beach is a public beach, you cannot simply cut across private property to get to the beach from the road. Either you must use one of the public access paths or obtain permission from a private property owner to cross its land. 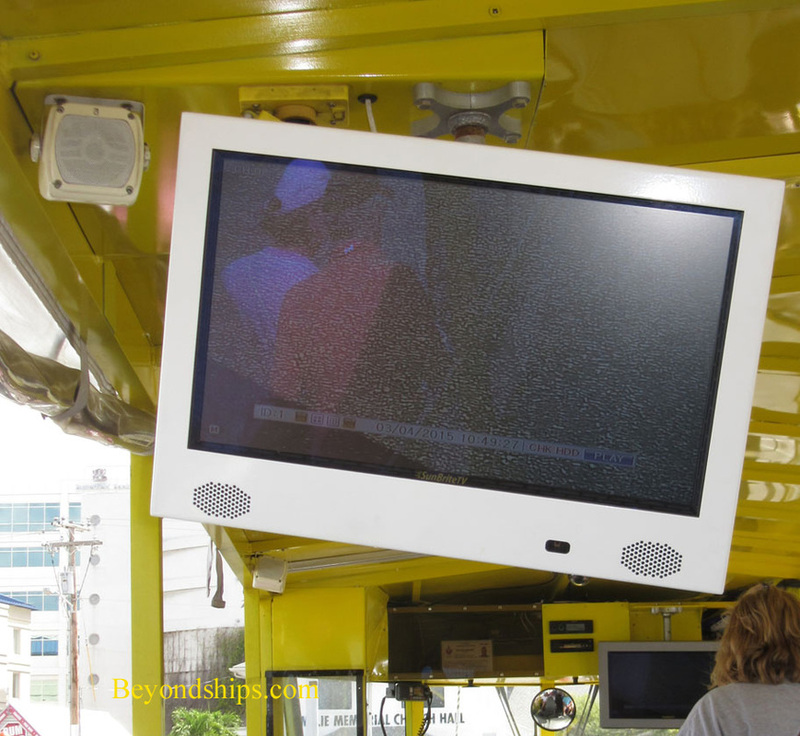 Above: Video screens are located at strategic points around the bus. 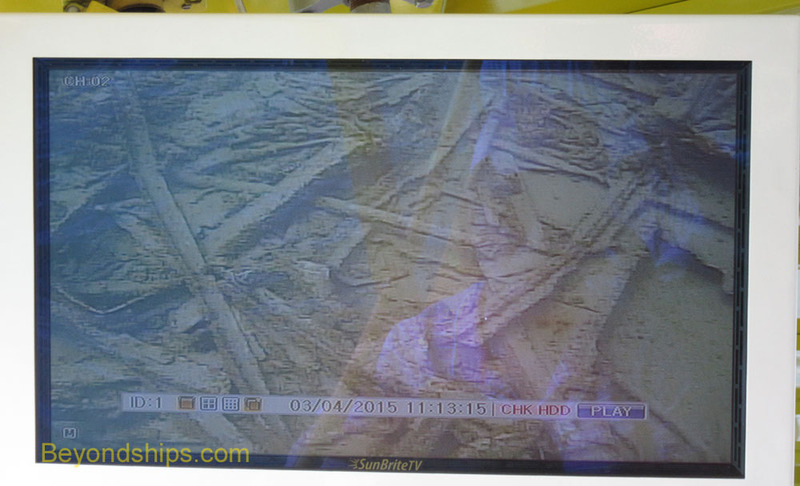 Below: The image of a shipwreck appears on the video screen as the bus passes over the wreck. Above: The bus sails by Disney Magic. Above: Fish appeared around the bus looking for food. Above: Following the voyage around the bay, the passengers relaxed on Seven Mile Beach. On this tour, permission to cross had been obtained from the Royal Palms resort. We simply had to show our tour wrist bands at the security check point to enter without an admission charge. Once inside, we could use the resort's bar, restaurant and other facilities or just pass through to the beach. As this was only a half hour stop, we choose to walk along the beach. 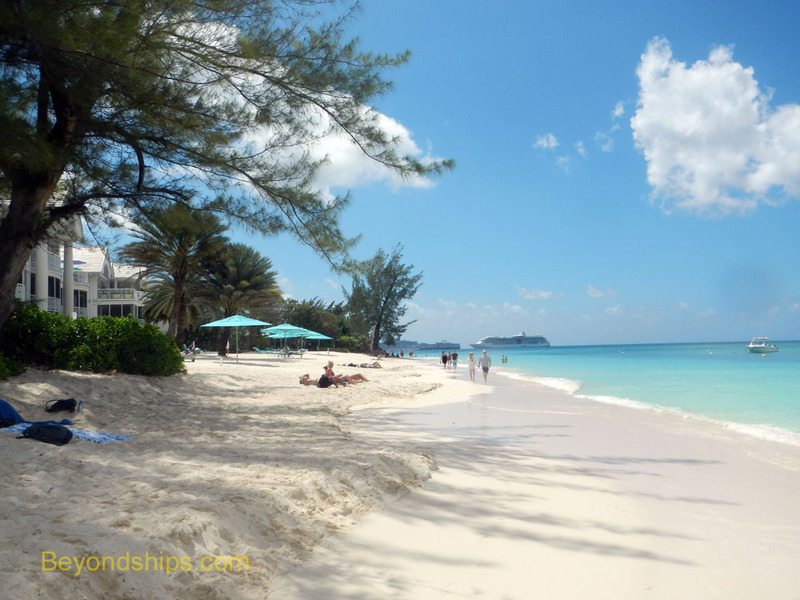 Seven Mile Beach is a beautiful beach with a strand of white sand lapped by turquoise water. The water was cool and refreshing. It is a very popular beach both with cruise passengers and with people staying at the hotels and resorts which border the beach. However, on this day, there seemed to be fewer people the further you walked away from George Town. In any event, it was a relaxing stroll. The tour participants had the option of staying at the beach and making their own way back to the ship. (See separate article on walking to Seven Mile Beach). However, most re-boarded the Hydra Terra Bus for the ride back into town. Along the way, the guide spoke about life on Grand Cayman and about shopping in Georgetown. His commentary throughout the tour was both informative and often amusing.